What the heck is a mobile payment? Mobile payments seem to be the talk of the processing and tech industries these days. Visa, MasterCard, Paypal, a million startup companies, and just about every major player in anything related to payment processing, is working on some sort of mobile payment mechanism. So what exactly is a mobile payment? The term mobile payment is a fairly ambiguous term that could relate to a number of payment technologies. It’s thrown around so much for the buzz effect, that when looking at any announcement about mobile payments, there’s really no way to understand what they’re talking about. Starting with what currently works, wireless credit cards terminals are the most used type of mobile payment. These are merchant based credit card terminals that process over a cellular or WiFi connection. They work just like a credit card terminal you would see on a counter, but they can be carried around. Merchants can also use a variety of mobile phone based terminals like the Way Systems terminals, or the more recent Iphone or blackberry card swipers. These turn a cell phone into a mobile credit card terminal, and often allow the merchant to use their existing phone for processing. 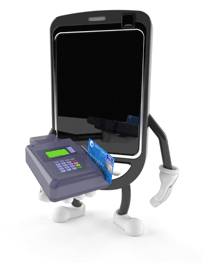 Mobile phone based terminals can offer considerable savings over all-in-one mobile credit card terminals. For merchants not needing to swipe their customers cards, the setup cost is essentially nothing, they just key transactions into their phone. With the exception of some of the new smart phone and iPhone swipers and applications, these systems aren’t new and not particularly exciting, so let’s move onto the more innovative mobile payments. Have you ever seen a commercial or advertisement that told you to text “SOME MESSAGE” to 555-555-5555 and a $5 charge will be on your next bill? This is a SMS payment. The company you are paying has a relationship with cellular carriers that allow them to collect payments from customers through the carrier. These types of services exist with both merchant initiated (they text you first) and customer initiated (you text them) text messages. SMS billing is best suited for very small ticket, and usually phone related items like ringtones. While a useful and very promising system to select business types, SMS billing has one huge drawback. SMS billing is extremely expensive. In my research I failed to find a single SMS billing company that charges under 50% per transaction! Yes, 50%, and you thought credit card payments were expensive. Until SMS billing costs can be reduced to a reasonable sub-5% per transaction, they are simply cost prohibitive for the majority of business models. Mobile wallets are the future of mobile payments and are actually something exciting in the payments industry, believe me this doesn’t happen more than once every 5 years or so. The idea behind a mobile wallet is that you can use your cell phone to pay for a product in a retail store, just like you would using a credit card. Your cell phone would be linked to the payment method of your choice, credit card, bank account, paypal, etc… Since almost everyone has a mobile phone, it seems a natural evolution to be able to pay for something with it. No need to carry a credit card, just swipe your phone and your transaction is complete. Despite the immediate appeal, mobile wallets have some enormous hurdles to clear before they can even get a set foundation. If it were easy, we would have had this convenience 5 or 10 years ago. Just about every major company with any connection to payment processing is trying to figure out a mobile wallet solution. Next week, I’ll go into the ideas, technology, and hurdles that need to be covered before mobile wallets become a reality.